Railway will become the first government department to give 10 percent reservation to the poor in general category. In the next two years, 23,000 jobs will be given to General Citizen's Garibon, Railway Minister Piyush Goyal said. He said that the Railways will recruit 1.31 lakh employees in the next six months and will hire more than one lakh employees in the next two years. It is worth mentioning that there are a total of 15,06,598 employees in the Indian Railways. Out of which 2,82,976 vacancies are vacant. In the first round of the upcoming railway recruitment, notification of recruitment program will be announced for 1 lakh 31 thousand 428 posts, followed by notification for recruitment for 99 thousand posts in second round. The notification for recruitment of 1 lakh 31 thousand 428 posts is likely to be issued this month ie in February. If this month's announcement is not announced, then by March will come. There will be no announcement about which positions to be recruited in the first round, but soon the information will be provided by the Railway Board. It is worth mentioning that after the first phase recruitment, the second round will be recruited in next year ie 2020. Notification will be announced in June next year for recruitment to 99 thousand posts. In the first and second phase recruitment, 10% reservation will be given to economically vulnerable candidates. A total of 23 thousand positions will be for economically weaker sections from 2 lakh 30 thousand posts. Currently, the recruitment process for 1,51,538 employees is underway. Even after this, 1,31,428 vacancies remain vacant. It is to be noted that in the 2019-20, between 53,000 and 2020-21, 46,000 employees will be retired. This will leave more than one lakh vacancies. 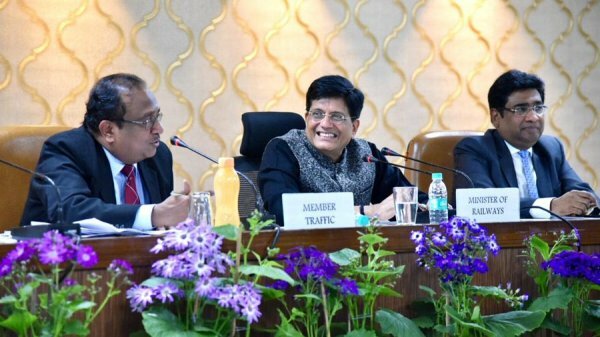 Goyal said that the railways plans to provide four lakh jobs in the next two years. He further said that since we have planned in advance, no space will be left in the railway anymore. Whenever the space is vacant due to retirement, the space will be filled immediately. Due to the 10% reservation for the general category poor, SC, ST and OBC will not be affected by the current availability.